Situated in the northwestern part of India in the State of Punjab, 51 km east of Lahore, Pakistan, the city of Amritsar is globally famous for the Golden Temple and the unfortunate Jallianwala Bagh tragedy. One of the loveliest tourist destinations in India, Amritsar was discovered in 1574 by Guru Ram Das. 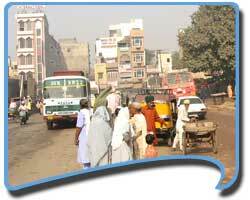 The several Gurudwaras in this city are some of the greatest attractions for tourists. Located near the Golden Temple, it is a witness of the tragedy called Jallianwala Bagh Massacre. General Dyer opened fire at the venue where thousands of Punjabis gathered from nearby places to celebrate the festival of Baisakhi Day, on 13 April 1919. About 28 kms from Amritsar, the Wagah Border is an army outpost on India and Pakistan border between the cities of Amritsar and Lahore. A new age garden, which houses Maharaja Ranjit Singh’s palace. Presently it serves as a museum. Situated on the Amritsar-Chogawan road, where Valmiki Maharaj is supposed to have composed Ramayana, it is another of the tourist attractions in Amritsar. At about 25 kms to the south of Amritsar is situated the Tarn Taran – a lake which bears holy as well as medical associations attached to it. Built by Ranjit Singh, it has fairs being celebrated on every ‘Amavas’ night. The water of the tank is said to have healing effect for skin diseases.